The days, and even weeks, are flying by so fast here. I will soon get you a review over the best restaurants I visited since my last update but first I must explain that this will not be a blog about good restaurants and experiences alone. (Why are there so many blogs writing only about It is equal important to learn about the warnings out there, right? So here we go – The Sunflower Diner (26th and 3rd), don’t you ever go there! In a moment of loneliness, extreme hunger and with a wish of transporting myself to Greece I went here (just across the street from where I temporarily stayed atm) to have a Chicken Gyros. 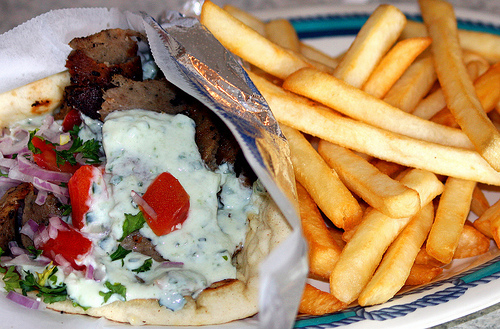 Gyros brings me back to good memories, sun-kissed skin at Hydra, my best friend Cissi and with the enormous proportions of food I know American diners deliver I knew it was a safe bet. I ended up with a Deluxe Platter which also came with fries and a greek salad. BUT – as you already guessed, I got so disappointed. The “Chicken” came as strips that looked worse than the attempts of making vegetarian food appear meaty. It was grey in the color and flavor-wise something uncertain. The salad was at least somewhat better than the forest served at Westville but the feta was fake rubber and salad is unfortunately not what you’re looking for when you desire a big stodge. Fries were of course damp and almost cold. I was very lucky I ordered a chocolate milkshake as well. It turned out this milkshake would make the meal of the night for me and I didn’t get transported to Greece – I stayed in the US where they at least know how to make a really good shake!